There’s nothing quite so decadent as a chocolate fondant. While they’re a favorite of fancy restaurants, they’re actually really easy to make at home. 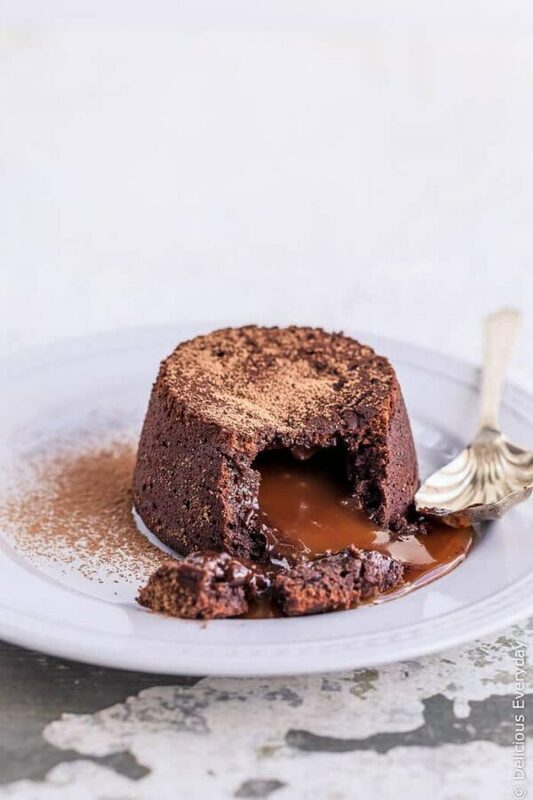 All you need is a little patience and you’ll be rewarded with a delicious chocolate fondant, complete with an oozing salted caramel filling. Plus, it’s 100% vegetarian and gluten-free with an easy dairy-free option. Despite appearances, making a chocolate fondant at home is actually quite easy. The only special equipment you’ll need are some inexpensive dariole moulds. The key to a good chocolate fondant is patience. It’s critical for getting that oozey runny center, for which chocolate fondants are famous. 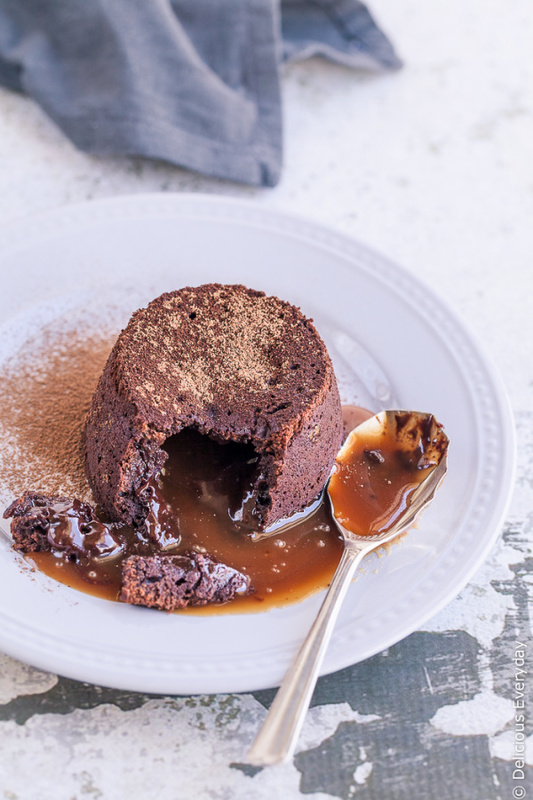 In this chocolate fondant recipe, we’ll stuff ours full with a delicious salter caramel center. Oh, and did I mention they’re gluten free too!? What is a chocolate fondant cake? 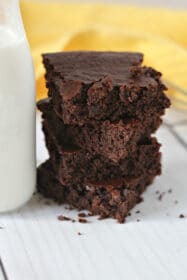 A chocolate fondant cake is a chocolate cake that typically has a crunchy exterior, and is filled with a creamy filling. When you crack into the cake with a fork, the center filling oozes out. For this reason, chocolate fondant cakes are also knows as chocolate molten lava cakes. Can I make chocolate fondant in advance? Yes! You can prepare the chocolate fondant cakes up to 24 hours ahead of time, and store them in the refrigerator. 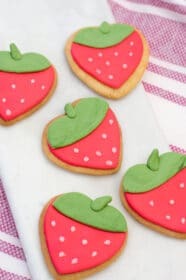 Just be aware that they will require a bit of extra time when baking if they are starting out cold. Start the recipe a full day ahead of time, so your salted caramel filling has time to cool. This will help keep the center filling in place when you assemble your fondants. Pick up a set of inexpensive dariole molds to make the process a lot easier! The molds need to be well greased in order to slide out the finished cakes without breaking them. I suggest applying several layers of butter or coconut oil, and chilling the molds in the fridge for a few minutes between each layer. 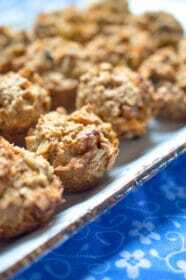 This recipe is 100% gluten free thanks to the buckwheat flour. But if that’s not important to you, all-purpose flour will work just as well. This chocolate fondant recipe can be made completely dairy-free. Just substitute coconut oil for the butter and coconut milk for the cream. Add another layer of flavor by using smoked sea salt in the salted caramel filling. If you like these chocolate fondants, you’ll also love these flourless chocolate fondants. And if you’re in the mood for chocolate, these chocolate macarons with dark chocolate ganache are one of my favorites. 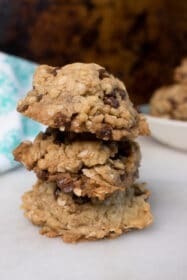 And finally, check out these Smoked Sea Salt Flourless Chocolate Cookies for another decadent gluten-free, chocolate dessert. 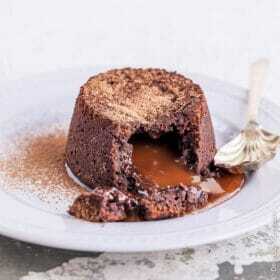 These chocolate fondant cakes are filled with a creamy salted caramel filling. They're easy to make and 100% gluten-free with a dairy-free option. Start this recipe a day ahead so that you have a chance to thoroughly chill the salted caramel sauce. Place the sugar and water in a medium saucepan and gently swirl the pan to ensure all of the sugar is covered with the water. Place the saucepan over a medium heat and simmer until the sugar turns a chestnut brown colour. Add the butter or coconut oil and stir until the butter is melted and incorporated into the sugar. Now carefully add the cream. Be careful with this step as the sauce will bubble violently, so add the cream slowly. Stir well and allow the mixture to bubble and boil for a further minute. Remove from the heat and stir in the flaked sea salt. Leave to cool for 20 minutes before pouring into a glass jar and refrigerating overnight. Preheat the oven to 400 degrees Fahrenheit (200 Celsius) and place a baking tray inside the oven. Grease 2 dariole molds well. I like to do this with a couple of layers of butter or coconut oil, and chilling in the fridge in between each layer. Coat the inside of each mold with 1/2 tsp of cocoa. To make the fondants begin by melting the chocolate and butter (or coconut oil, if using). You can do this by placing a heatproof bowl over a pan of gently simmering water or in the microwave in 20 seconds bursts, stirring each time. Place the egg, yolk and sugar in a bowl and whisk well to combine. Add the chocolate mixture along with the flour and stir until well mixed. Fill the darioles with half the mixture. Then remove the caramel from the fridge. By this time it should be firm and pliable. Scoop out 1 1/2 tbsp of the sauce and roll it into a ball and place it in the center of the chocolate mixture, making sure it doesn't touch the sides. Top with the remaining chocolate mixture. Place the fondants in the oven, on top of the baking tray, and bake for 10 minutes. The top of the fondants will turn a glossy matte. If the center still appears glossy bake for a further minute or two until it looks matte. Remove and let them sit for 3 to 4 minutes before removing from the moulds. 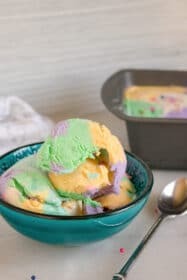 They should come out of the darioles fairly easily, assuming they are well greased, but if they don't use a palette knife and run it carefully along the inside of the mold before turning upside down onto a serving plate. Serve dusted with cocoa powder and your favorite ice cream or cream. For a slightly more complex flavor I love using smoked sea salt. 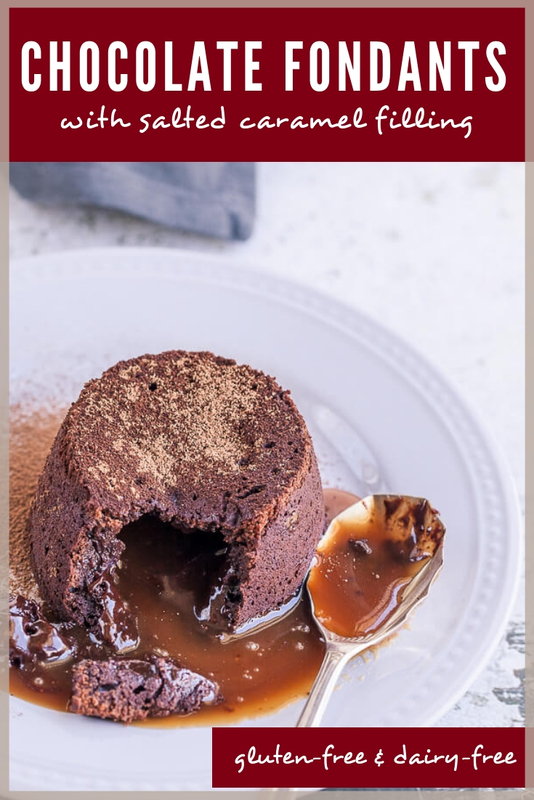 This chocolate fondant looks utterly fabulous & Yummy, I can’t wait to try it, Thanks for sharing such an amazing recipes..
Hi! Your site is beautiful, and your dessert looks beyond amazing! Thanks for responding to my concern in Food Blogger Central… I appreciate the help so much! This is beautiful, I mean absolutely divine ….I want to seriously dig in!!! That salted caramel filling looks like a killer winner! I adore your spoon, by the way, it’s so cute. Thanks Kavey. I adore the spoon too. I picked it up at a local antique store. Gorgeous, absolutely gorgeous! I have never tried making fondants at home myself. I ought to remedy this as you make it sound so easy!